V1520 Series – Gaska Tape Inc.
Gaska Tape’s V1520 Series product is a medium density closed-cell Polyvinyl Chloride foam coated both sides with an aggressive, pressure sensitive adhesive, A3, and 84# polycoated two side, brown kraft liner. V1526 is the same medium density foam; A3 adhesive coated on both sides, but incorporating a 4 mil blue polypropylene film liner. V1526SA is coated both sides with a solvent acrylic pressure sensitive adhesive, S3, and a 4 mil blue polypropylene film liner. 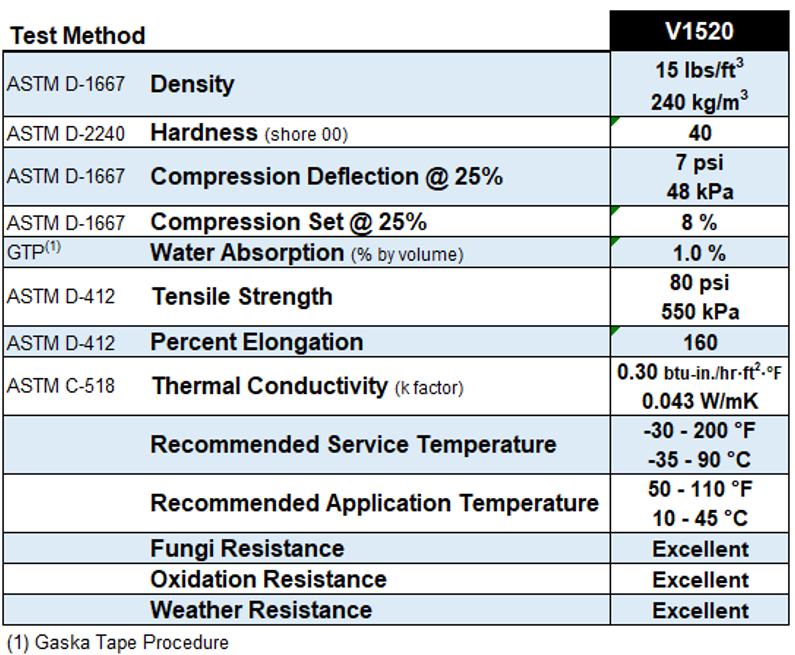 Gaska Tape’s V1526SA has a six-month shelf life with the solvent adhesive. Tested and approved to AAMA 810.1 expanded cellular glazing tapes. Effectively functions as a thermal break and insulator. Maintains a seal in high movement joints.